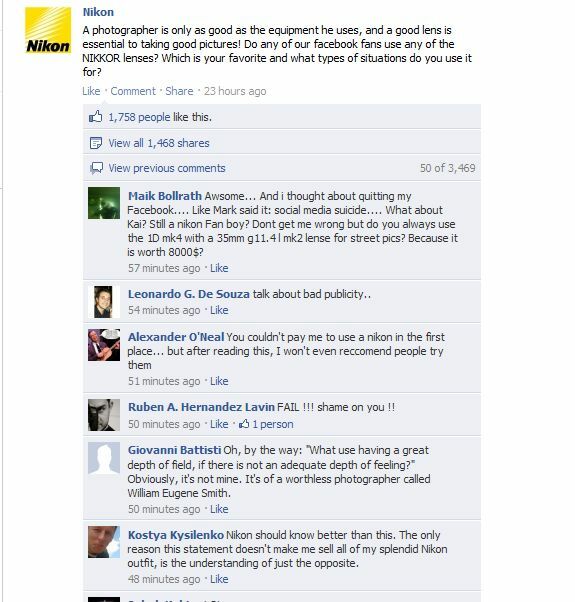 Major fuss today over on the Facebook page of Nikon, after it posted a status update that enraged many of its followers. The Japanese camera company’s fans took offence at the suggestion that equipment was more important than the photographer. Nikon received almost 1500 comments, many of which blasted the company for being too concerned about their own equipment and not caring about the craft of the actual photographer. The word ‘fail’ appeared a large number of times. 1) Nikon is a brand that sells camera equipment – why else would you follow them? Surely, they’re going to use their Facebook page to try and encourage people to lean towards more Nikon kit. OK, so their words were a bit hamfisted, but they were essentially trying to get people to talk about Nikon products. That may not have been the greatest use of social media, but fans complaining about Nikon trying to ‘promote’ Nikon are very misguided. 2) The number of complainants were very small. At time of writing, Nikon has around 841k followers on Facebook. Of that number, only 0.17% left a comment and not all of the roughly 1500 comments were negative. Admittedly, you never want to get bad press as an organisation, but it wasn’t exactly widespread condemnation. 3) A slightly more semantic point on the original post. Agreed, Nikon shouldn’t have dissed the art of the photographer, but if it’s all about the person, why doesn’t everyone use a disposable camera to take photos? Why do snappers need to shell out on the equipment and lenses that Nikon were trying to promote? Interestingly, what this does highlight – yet again – is how fraught with difficulty social media can be for commercial organisations. People want to follow their favourite brands, but it seems as if they don’t like them being too important and opinionated. Nikon did post an apology, but it took them 15 hours to do so – pretty poor. It really shouldn’t have taken them that long to react to a crisis situation. To be honest, that was probably their biggest faux pas. Ultimately, though, they’re unlikely to lose that many of their followers and in a couple of months, most people will have probably forgotten all about it.